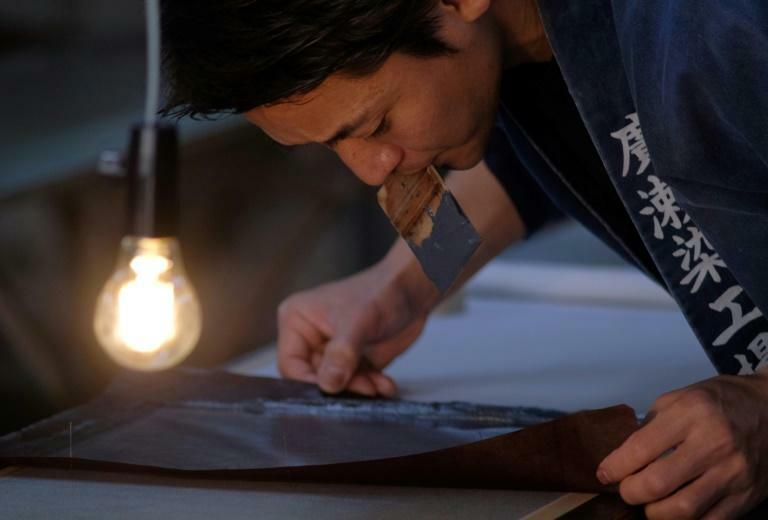 At a century-old workshop in a quiet Tokyo neighbourhood, craftsman Yuichi Hirose brushes dye across meticulously hand-cut stencils laid on fabric, using a traditional technique to produce contemporary kimono patterns. Demand for the elaborate, elegant centrepiece of the Japanese wardrobe is in decline, but a handful of artisans and entrepreneurs like Hirose, 39, are trying to revive it. "The kimono has become something that is very far removed from our daily lives," said Hirose, who joined his family business after university. He specialises in "Edo Komon" -- a kimono pattern hand-dyed with a Japanese washi paper stencil, which dates back to the Edo period between the 17th and late 19th centuries. It's a deeply traditional craft that requires great skill to master, he said, "but we need to create something that is accepted in this modern time". Hirose's innovations include developing new designs to adorn the kimono, including tiny sharks or even skull motifs. Once a standard of the Japanese wardrobe, the kimono is now often a garment reserved for special occasions, such as weddings and coming-of-age ceremonies, and is mostly worn by women. They can be hugely expensive and women often hire experts to dress them because the outfit requires seemingly endless nipping, tucking and strapping. The modern kimono industry peaked in 1975 with a market size of 1.8 trillion yen ($17 billion), according to the Ministry of Economy, Trade and Industry. But by 2008 it had shrunk to 406.5 billion yen and further to just 278.5 billion yen in 2016, according to a survey conducted by Yano Research Institute. 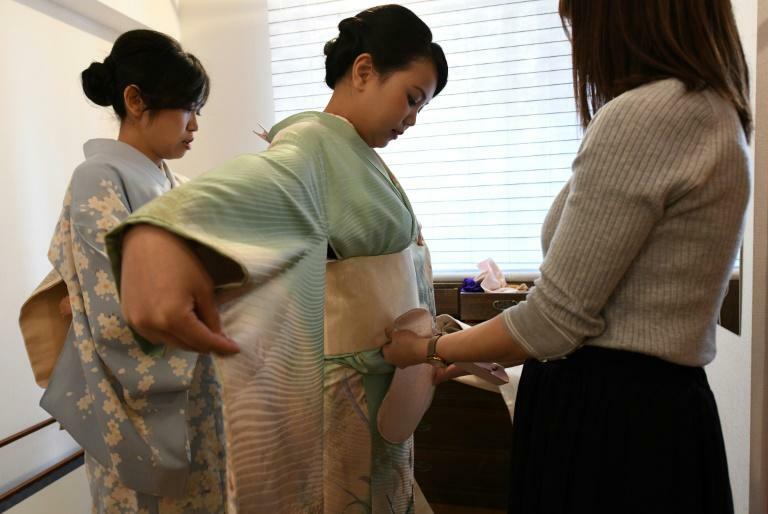 "There are many hurdles" to buying a kimono, said Takatoshi Yajima, vice chairman of the Japan kimono promotion association, and a kimono manufacturer. "It's expensive. It's difficult to wear. It's too delicate to wash at home," he said. "We need to make kimonos that are affordable and wearable. If we do that, I believe more young consumers will buy kimonos." He has nearly doubled his number of customers in the past 15 years by selling more kimonos under the 100,000-yen ($930) price tag, well below the many thousands of dollars a high-end piece can cost. "The industry will grow if we can create a market in which as many people as possible will buy a kimono," he said. A complete kimono outfit starts with an undergarment known as a nagajuban, over which the kimono is layered, held in place with a thick obi belt and string. The outfit is completed with tabi, ankle-high white socks divided at the big toe to allow feet to slip into thick-soled sandals called zori. But beyond the basic framework, designer Jotaro Saito says there should be room for experimentation. "What's fabulous, what's unfashionable and what's cool change every year. It's wrong that kimonos don't change even if everything else is changing," said the Kyoto-based designer, whose work has been worn by American singer Lady Gaga. "Kimonos are not something old. Wearing a kimono is the coolest and the most fun thing." 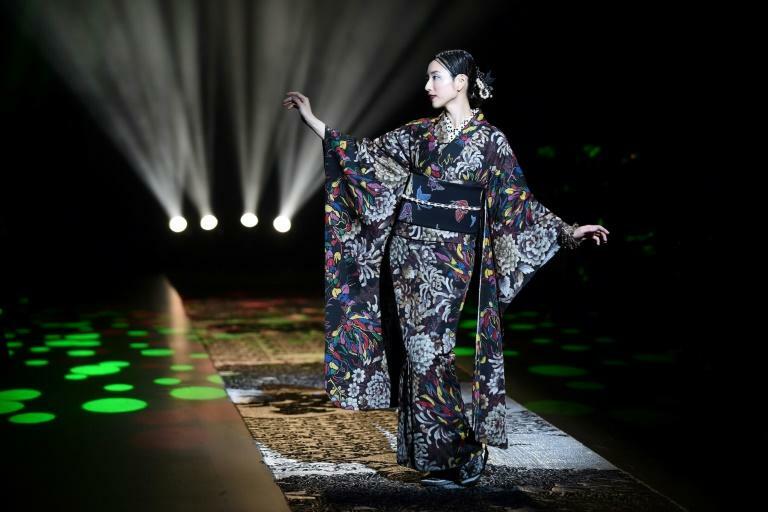 At Tokyo fashion week in March, Saito, who calls himself "a risk taker," showcased kimonos for men and women, mixing traditional and unconventional motifs and colours. "I want to present kimonos as a wardrobe in which people can truly feel joy," he said. And while demand for kimonos is falling among Japanese, services renting the garments to foreign visitors are booming. Interest is expected to expand, according to the Yano Research Institute, with more tourists visiting Japan and looking for cultural experiences. Kahori Ochi serves around 500 foreign tourists a year at her kimono rental store in the trendy Harajuku area of Tokyo. They pay around 9,000 yen ($80) to be dressed in a kimono worth about 300,000 ($2,750) yen. "Kimono is a piece of Japanese culture. I really wanted to experience that," said Ruby Francisco, a Dutch tourist who rented a pale green kimono at Ochi's shop. "It's special. It's like an honour to wear," the 33-year-old said, adding that she would post photos of herself in the kimono on social media to show her friends. Ochi's mother ran a shop selling high-end kimonos, but she didn't expect to follow in her footsteps. "My mother told me the kimono business is risky and volatile," she said, adding that her mother's shop struggled after the bubble economy ended in the early 1990s. "I used to think kimonos were not cool and practical." But Ochi changed her mind after spending a summer in Norway, where people complimented her kimono. She decided to join her mother’s shop, but being the owner’s daughter came with no privileges. "She said 'no salary for you,'" Ochi laughed, recalling her mother’s surprise at her sudden interest in the industry. But now, she says, business is booming and she expects the Tokyo 2020 Olympic Games will drive new demand as tourists flock to Japan. "But my goal is not to expand the business," she added. "I hope to meet more people who want to understand Japanese culture."